Price includes 12 months support and free updates. 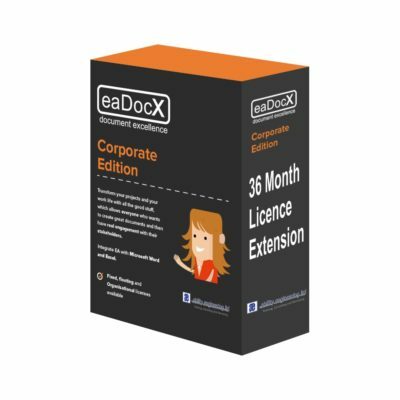 This is a 10-user group license for the Corporate Standard Edition of eaDocX. eaDocX™ is the Microsoft Word and Excel document generator add-in for Enterprise Architect, producing ready-to-publish high-quality documents that simplifies model and document review and updating. eaDocX has a simple GUI interface for content direct into Word or Excel. Print all your EA content using familiar Word styles and formats. Publish online with links and instructions for reviewers. Edit and import EA data fast using Excel. Make EA accessible anywhere, on any device. 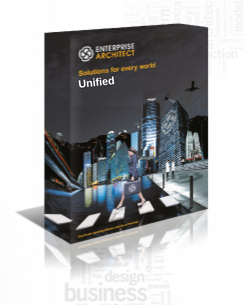 Reduce the time needed to collate feedback and update. Speed up document reviews and approvals with clear instructions. eaDocX will not work with Word 2010 /2013 where used in the new Click-to-Run style, as this only downloads parts of the Word application and not the parts which eaDocX uses. eaDocX works fine with fully-installed 2010 and 2013. In Excel 2013, eaXL does not open inside Enterprise Architect but in an external window. However all eaDocX features work fine. This is an open item with Microsoft and we are waiting for the Microsoft fix.